PSIPL offers a comprehensive range of smart, innovative facilities management solutions that target cost effective, sustainable results at our clients’ facilities and workplaces. We have a structured Employee Engagement Programme in place which is part of our unique DNA that sets standards of what we need to do to be an employer of choice. Our best practices, industry excellence and thorough services will ensure that your business sees the results you need. As end-to-end specialist covering the entire spectrum of facilities management, we will identify the optimal management concept for your property & deploy our know how to ensure a smooth operation of your utilities. Our extensive experience ensures high-class service standards that respects and enhances the ambience, well-being and hygiene of our client’s environment. Our integrated pest control services protect your premises, products and goods, and ensure they meet the appropriate quality, health and safety regulations. Our pest control solutions establish practices that allow you to comply with stringent local and international legislations and standards. We plan your activities such that you never have to trade off your core operations for your complex and specialized requirements and help you augment your capacity to full potential. We also keep you updated on the latest industrial trends. We resolve to protect your property and people by adopting stringent processes and use of technology to maintain safety and security. We provide end-to-end security services or we can supplement your existing security arrangements. We have extensive institutional expertise in managing and maintaining critical equipment and properties. 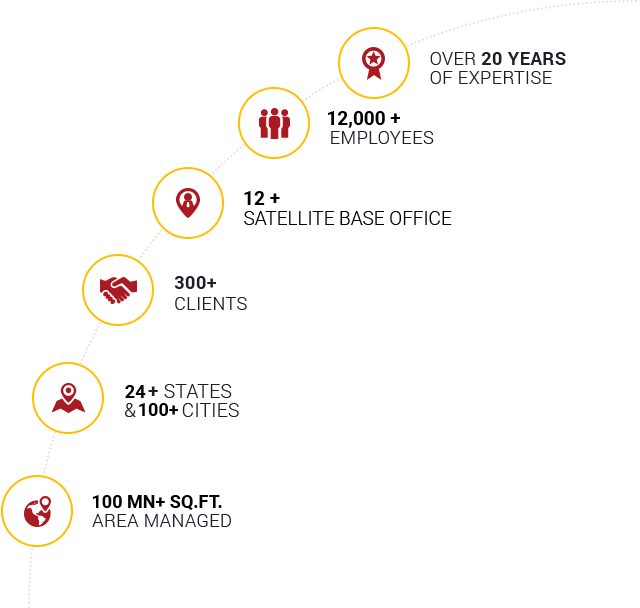 The array of these specialized services will help our clients uncover long-term strategy to meet their unique goals. How we saved more than 40% in AHU consumption! Excellent operational competencies reflected through our trained Facility Management Team that enables you to focus on your core responsibilities. Customer centric self-delivery model focusing on creating efficiency and delivering high-quality, standardised services consistently. Proactive management focussed on building long-term relationships by adhering to the best practices in the industry. Creating synergies through our Integrated Facility Management Solutions via a single point of contact and motivated workforce. Fully compliant and ethical organisation with adherence to all Labour and Taxation laws. A centralised procurement cell ensures cost reduction and quality optimisation. Online tools for dashboard reporting, asset management, workforce planning and learning and development. Our standardised procedures have accreditations for Quality Management, Environment Management, Energy Management, Occupational Health and Safety.